Tap My Workflow Tasks to see the list of tasks assigned to you. Tasks are sorted by due date so that you'll always see the most due task first. Any workflow task that is past its due date will be displayed in red. 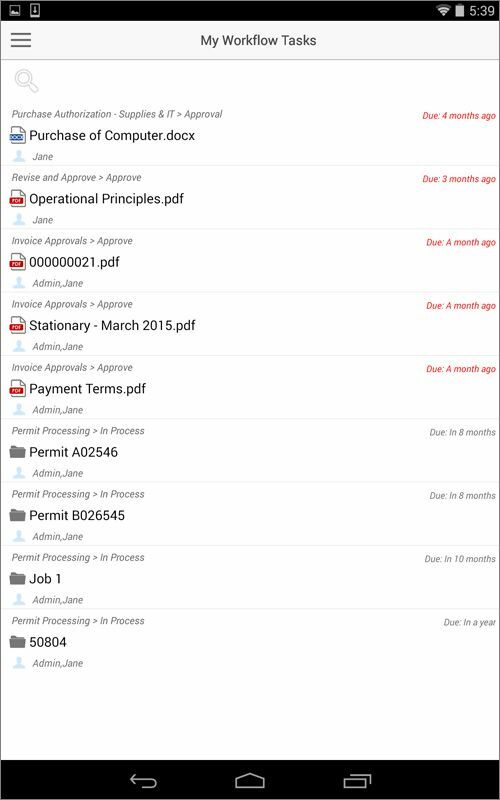 All of your tasks are synced with your Docsvault repository in real time. 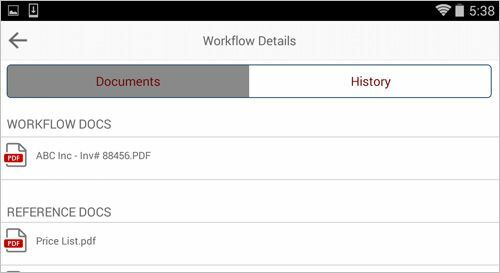 This tab will list all the documents associated with this workflow instance including the main workflow documents, any reference documents and all documents attached during the previous steps of this workflow. 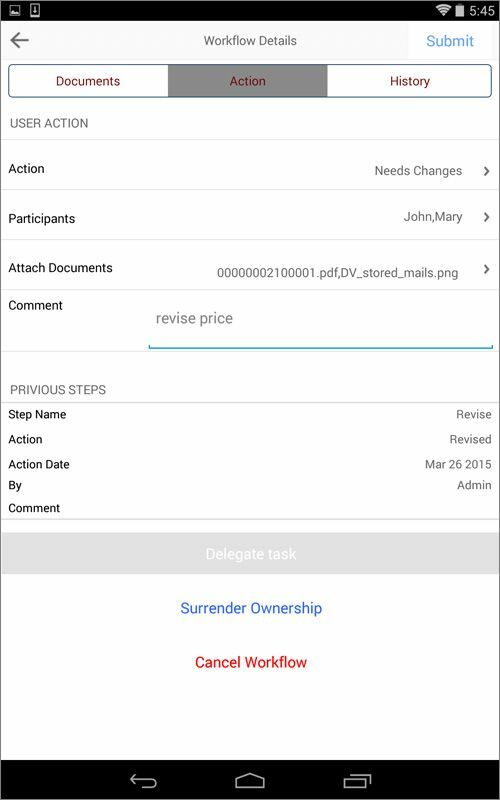 Tap on the Action tab to display all involved participants, previous step actions & comments, delegation options and user actions to be performed in this step. User Action: Tap on to select appropriate User Action. You may be prompted to verify your identity by having you enter your Docsvault system password before your chosen action can be submitted. Participants: Displays Participants of next step. If allowed, you may change the participants of the next step. Documents: If allowed, you may even attach supporting documents and folders from Docsvault repository with your chosen action. Comments: Enter your comments for the selected action. Previous Steps section displays the previous step actions, participants & comments. Delegate Task: Tap this button to assign the task to another person. Learn how to delegate a task from Automatic Task Delegation. Note that the delegation option may not be available if it has been restricted by the workflow designer. Take Ownership: You can take ownership of a workflow step if multiple participants are involved for a particular step. Cancel the Task: Administrators and Workflow Managers can cancel a workflow. This tab displays all the actions performed by other workflow participants with their corresponding comments.